Life has a way of wearing us down sometimes, and it can do the same thing to your floors. Whether it’s dings and scratches or faded spots from the sun, your floors need TLC to protect them from looking old before their time. Here are some of the most common types of flooring on the market today and how you can help them look as fresh as the day they were installed. Many homeowners love the look and feel of traditional hardwood in their home, but as beautiful as hardwood is, it is also a bit finicky and requires diligent maintenance. 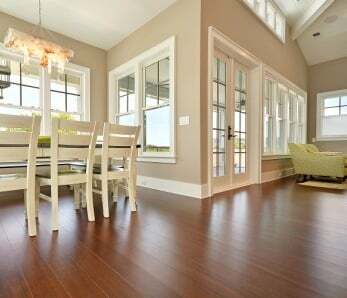 As with other flooring like bamboo and cork, be mindful of denting and scratching your hardwood floors. Never slide heavy furniture across your floors and make sure to sweep and vacuum regularly to get rid of and grit and debris that could scratch the finish. Also, don’t mop wood floors with soaking wet mops as the water could seep into and in between the wood planks causing your floors to buckle. 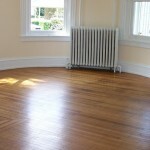 Exposure to the natural sunlight has the ability to cause your floors to fade. Having said this, the extent of damage depends on the type of wood your floors are made of. Woods like cherry and oak tend to get darker with aging because they are burned by the UV light. Other woods, however, will lighten after prolonged exposure to sunlight. To prevent burning or fading from the sun, you can apply a water-based urethane finish to your floors that will minimize some of the sun damage that’s caused by oil-based finishes. You should also be sure to have curtains and/or blinds on your windows to help keep sunlight out. There are even window films you can purchase that will allow light through but block UV rays, much like a good pair of sunglasses. 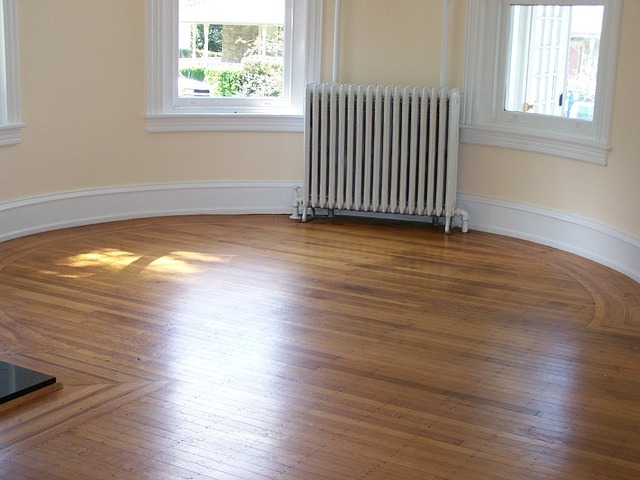 Other options are rotating the furniture, rugs or other large objects in the room to ensure the floor is evenly aged. Cork is the kind of flooring that provides you with a warm, soft, cushiony feel. If you want to walk around your house feeling like you’re walking on pillows – you may want to try cork. Besides having a gentle feel on the ol’ feet and legs, it also has the insulating qualities and resiliency of carpet, plus it’s easy-to-clean like tile; and it’s made from tree bark, so it’s a natural and renewable resource and environmentally friendly like bamboo. But, like other flooring materials, exposure to UV light can cause color variation – most notably – a yellow coloring. As with hardwood, you may want to consider using large area rugs and large furniture – which you can rearrange from time-to-time, blocking light and allowing even discoloration. And of course, during peak sunlight hours in the afternoon, draw your blinds and curtains. One of the drawbacks of having such a luxuriously soft flooring is that it is very susceptible to scrapes and scratches, so never drag furniture or heavy items across it, do not wear heels inside, and make sure to keep your pets’ nails trimmed. 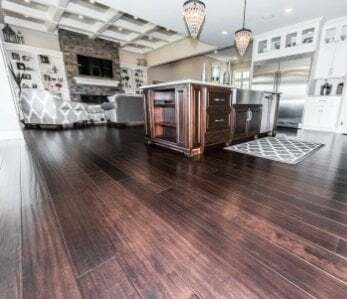 Vinyl flooring is considered a practical and hardwearing material, but it can still become damaged through everyday wear and tear and can also become faded and discolored. Vinyl will generally become discolored either through light or heat. Again, during peak sunlight hours, keep as much of that damaging UV light off of your floors as you can by drawing your curtains. Well, either that or rub a good SPF lotion all over your floor, but that seems highly impractical. 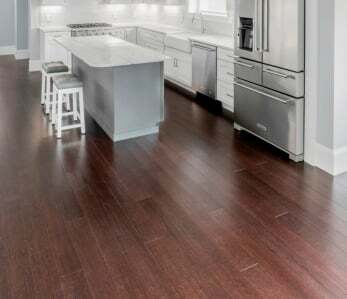 Many homeowners choose to install vinyl in their kitchen, and if you decide to go this route you will want to place non rubber-backed mats in key areas to protect your floors from certain appliances that send large amounts of heat to your floor. 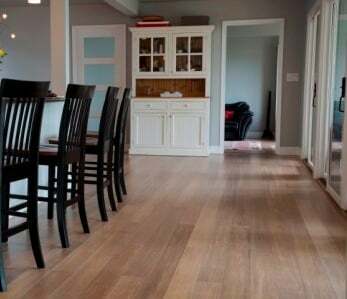 In recent years bamboo has become a popular flooring choice for many homeowners and commercial builders because it lends a traditional beauty and warmth like hardwood, is extremely durable, visually unique, affordable, and environmentally friendly. It also is very versatile and holds a beautiful finish. But, even bamboo’s color can fade if exposed to long periods of sunlight, so you’ll want to make sure to install window treatments in your rooms to keep that pesky UV light out. 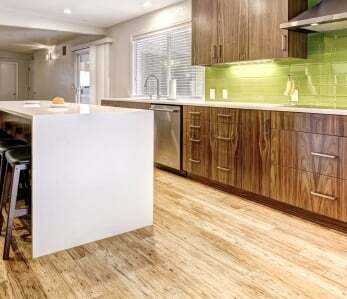 And, although durable (strand woven bamboo flooring is almost 3 times as hard as oak!) it can still scratch on the surface like any other floor, so clip your pets’ nails, no high heels, don’t drag heavy items across the floor, and never clean bamboo floors with a soaking wet mop or steam mop them. Although we always recommend bamboo flooring as we can personally attest to its many benefits, the choice of flooring is obviously up to you. Any floor installation is a major investment of your time and money, so be sure to take care of your floors so they as long as possible. ‹ Build an Outside Deck with Sustainable Bamboo? Absolutely!